In 1865 the Anglo-Irish Province of the Redemptorist was inaugurated, and the Superior General - Most Rev. Father Mauron informed the new Provincial, Fr. Robert Coffin (later Bishop of Southwark), that it was the wish of the Roman provincial, Father Edward Douglas, who came from a wealthy Scottish family, to see a house of the Congregation of the Most Holy Redeemer established in his native Scotland, for which he would provide the money. The following year, in 1866, Fr. Coffin travelled to Scotland from Clapham with Father Edmund Vaughan to explore a suitable site for the foundation in that country. The obvious location was the west of Scotland where the majority of Catholics had settled, but this was ruled out because of the presence of the Jesuits and the Passionists, and by the virtual schism between the Scottish and Irish priests in the District, which, given the number of Irish Redemptorists, Fr. Coffin feared would be a source of trouble to the Congregation. Their travels took them to Glasgow, Rothesay, Edinburgh and Stirling, the latter please been considered …. “beautiful, but the natural and physical beauty of the sport could not remove the poor impression given by the evidently and completely anti-Catholic spirit of the place” Dr Rigg, the senior priest at Saint Andrew’s cathedral in Edinburgh (and who had lived and worked in Perth for nine years) suggested the “Fair City” to the two Redemptorists. On 21 May 1866, a visit was made to the Earl of Kinnoull and, after successful negotiations, which were finally completed of Dupplin Castle in October of the same year, an area of land was purchased on the slopes of Kinnoull Hill, overlooking the city of Perth. A temporary hospice was established at St Mary‘s, Forebank, Dundee in June 1867, and three Redemptorists with Fr. Edmund Vaughn as Superior took up residence there. Operations began immediately for clearing the ground on Kinnoull Hill to prepare for the building of the monastery, and it was during these early stages of building that a remarkable incident took place. In October 1867, a Mr. Turnbull who owned the land which overlooks the new site, diverted water that flowed from his land through the Redemptorist property, and which was essential for the stonework that had to be undertaken to build them monastery. He also threatened legal action in order to prevent the continuation of the building. The small group of Redemptorist felt helpless in this hostile environment, and eventually turned to Mary, the Mother of God, in the hope that her powerful intercession would come to their assistance. On the final day of the Novena (Nine days of prayer) to Our Lady of Perpetual Help, one of the lay brothers struck a well whilst planting potatoes on the hillside, and a continuous flow of water appeared. This spring of water still flows to this day, and as ever since been called Our Lady’s Well (It is said that when the well ceases to flow the Redemptorists will leave Scotland). However, the water is supposed to contain healing properties, and several cures have been claimed by people who have drunk from the spring and put the water on their eyes. A shrine was built over the well in 1948-the chief part of which is the stone that was brought from Lindores Abbey by the novices of that year. The statue of Our Lady of Lourdes and of Saint Bernadette are the chief features of this holy spot. On 16 June 1868, the foundation stone was blessed by Archbishop John Menzies Strain (Saint Andrew’s and Edinburgh). In the following months, two lay brothers, skilled carpenters, were sent to Perth to make the furniture for the new monastery, and in November 1868, the first Mass was celebrated in the oratory. And the feast of Saint Joseph, 19th of March 1869, the house was blessed, and the community took up residence and thus the first Catholic monastery to be built since the Reformation was now ready to begin its new life. Standing there and all its new-born glory Saint Mary‘s, Kinnoull, looked down upon the “Fair City”, from which place John Knox had incited the mob to destroy the monasteries of the Carmelites, the Dominicans and the Franciscans, some 300 years before. Thus, after three centuries of persecution and bitterness religious life was alive once more in Scotland. The new house soon resulted in an increase in the activities of the Redemptorists in Scotland, where there had previously been only fourteen missions. 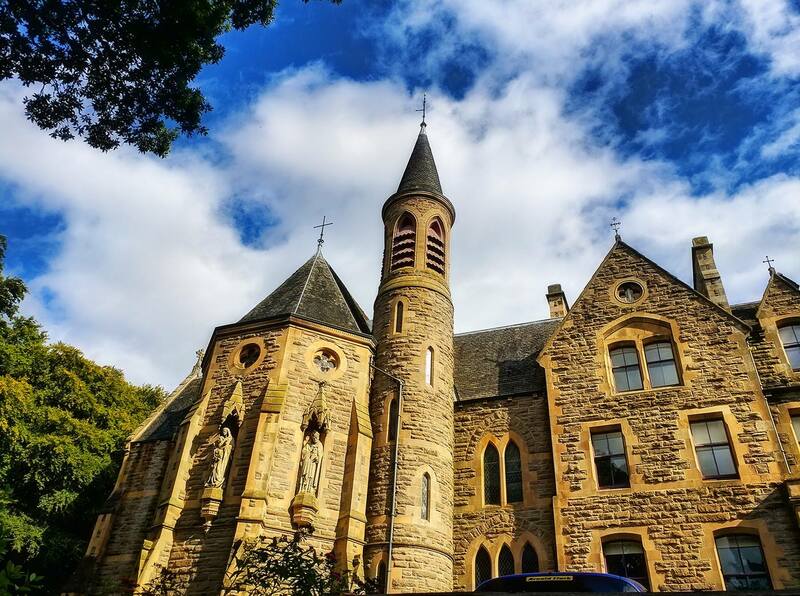 Kinnoull became ….” our purely missionary house …. the real Mission house of the Province” … more missions being given from there than from any other house in the Province at that time. On 22 March 1870 the newly constructed church was solemnly blessed and opened, and on the following day a copy of the miraculous image of Our Lady of Perpetual Help was placed in its present niche over the High Altar. The church was later consecrated on 29 November 1913 by Bishop Robert Fraser (Bishop of Dunkeld). Although the church and monastery are colloquially referred to as St. Mary’s, the church was formally dedicated under the title of Our Lady of Perpetual Help. It is understood that the church is the first church throughout the world, outside of Rome, to be dedicated under this title; the original copy of the icon having been given into the care of the Redemptorists in Rome in 1866 by Pope Pius XI. “…the church is built to the North of the College to which access is given from the main corridors, and the style of the building is early English. The plan is cruciform having North and South aisles. The chancel is the full width of the nave and the South transept is used as a sacristy. The extreme length of the nave to the chancel arch is 50 feet. There is a crypt below the north transept having a brick groined ceiling resting on a pillar at the centre; below the church is also the mortuary chapel. A circular turret is placed at the intersection of the South transept and chancel rising to a height of 68 feet with a roof 21 feet high. (During building work on this turret a local man fell to his death and was buried where he fell - a memorial stone marks the spot). The shafts of the nave are polished Hunting Tower stone, built on courses having moulded Dunmore bases and caps and the arches are of Fife Freestone. The clerestory windows are circular having quatrefoil cusping. The groining of the aisles are supported on corbels. The corbels and capitals at the entrance to the sanctuary were carved on the spot by one of Mr. Earp’s most skillful carvers. The new monastery was chosen as the ideal house for the Noviciate - the initial period of training in the religious life that all those who wanted to be Redemptorists had to undergo. The Second Noviciate was also established there and first took place in 1870. This was designed to make young priests…. “better trained and more strictly established in the practice of all the virtues of our apostolic ministry……”. It took the form of a long retreat, and during its six months duration it was hoped to renew newly-ordained priests in a spirit of piety and prepare them better for their future life as missioners. The first of three months was spent in making plans of Missions, Retreats and Renewals, and the young men were required to make written sketches of the Instructions they intended to give on these occasions - these were then discussed and criticised. The latter part of the Second Noviciate was spent in producing samples sermons, which were often delivered in front of the entire community, who would make comments on them! In addition to sermon preparation, the ceremonies of the Church were practised and the work of the Confessor discussed. Bringing all this training together were the spiritual conferences given each day by the Second Novice Master, who would be an experienced missioner, in which the virtues of a good Redemptorist admission were set forth and the dangers and faults outlined. In addition to its function as a training centre for the Redemptorist way of life, the monastery was used extensively by the Scottish bishops for their clergy retreats - a practice that is still part of the life of Kinnoull. The Catholic press rejoiced at..” The blessing is to be reaped by the Catholic church in Scotland from the establishment of so well-organised a house, and from the labours of the zealous Fathers, who give themselves up entirely to their holy work…. "(Tablet, 11 Sept 1869). Missions and retreat were preached from Kinnoull for nearly 20 years with little interference from the local inhabitants, who were at that time fiercely anti-Catholic. However, a problem then arose of a different nature. A portion of the wooded land near the monastery was wanted by the Earl of Kinnoull for development, and the loss of the trees would have destroyed the seclusion and privacy of the monastic grounds - so essential for the prayer and contemplation needed to live the religious life. All appeals failed and so the community decided to pray to St Joseph. A small statue of the saint was placed next a tree in the woods, and on the same day the Earl of Kinnoull’s agent informed the community that their lease was, after all, to be renewed, and at the former rent! Later, the community managed to purchase the freehold of all the land they had previously only rented, including the woods. The statue can still be seen in the spot where it was placed, as a thanksgiving to St Joseph. Requests for Missions and Retreats were now flooding in and there was a need for greater room in the monastery, in order to house in the community of priests, brothers and novices, as well as the large number of clergy who were constantly using the monastery for their retreats. Thus, in September 1895 the foundations of extensions were begun and on the 24th of December 1896 the beautiful new oratory at the top of the new extension was blessed by the Rector, Fr. Aloysius Palliola, and the next day the community gathered to celebrate the feast of Christmas in the same oratory adorned by the three magnificent stained-glass windows of St Alphonsus, St. Gerard Majella and St. Clement Hofbauer. During the 20th century, missions and retreats have continued to be preached to the Scottish priests and people, and for most of this time Kinnoull has also been the home of the novices. However, with the fall in the number of vocations it meant that in 1971 there was only one novice, and so the Noviciate was moved to Plymouth where it was felt a smaller community would be more conducive to the living of the Noviciate life, there was a brief period in the mid 1970s when Kinnoull was once again the Novitiate. The Redemptorist students also resided in Kinnoull after various spells in Wittem (in Holland), Teignmouth, and Mautern (in Austria). In This period of residence lasted from 1904 until 1922 when they were moved to Erdington Abbey in Birmingham. 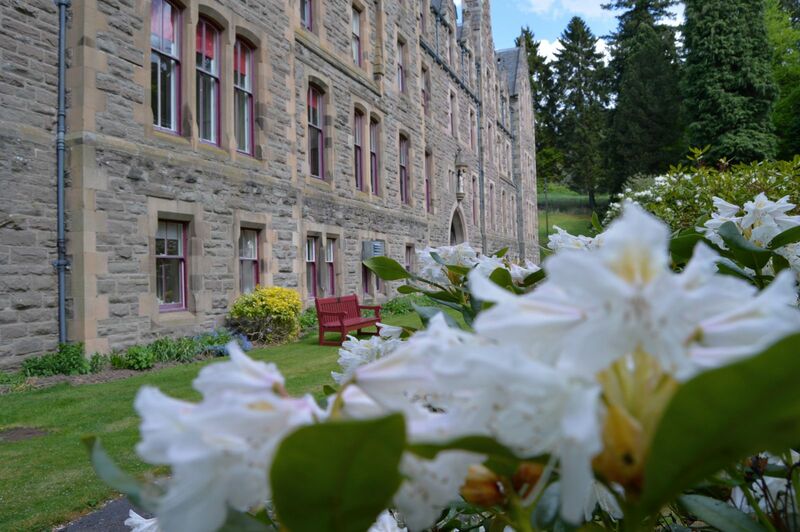 Perhaps the most dramatic change in the life of the monastery occurred in 1978 when females were first permitted to make retreats in Kinnoull. The Province confirmed this new policy in 1981 when St Mary's became a Mission and Renewal Centre to serve the spiritual needs of the Catholic people of Scotland. The mission of the Redemptorist continues here at St. Mary’s where as well as being the home of our Parish Mission Team, St Mary’s Monastery, continues as an international, multi-cultural, ecumenical place that offers its visitors the opportunity for relaxation, renewal and rest. As a Redemptorist community, we offer a full programme of courses and retreats as well as serving the local community with weekly church services.